As I watched the television coverage from the Masters I noticed that when analysts recalled the 2016 Masters, they did not speak of Danny Willett’s win, they focused on Jordan Spieth’s meltdown. Spieth had a five shot lead when he came to the back nine then disaster — bogeys on 10 and 11 followed by a quadruple-bogey (seven) on hole 12. Willett shot a bogey free 67 but that doesn’t matter because most golfers remember Spieth losing the Masters. Plus, it doesn’t help that Willett has played horribly since winning. The ANA Inspiration is another example. Can you name the winner of the 2017 ANA? I bet if you are a golf fan you vividly remember that Lexi Thompson was assessed a four-stroke penalty due to a Rules infraction that occurred during Saturday’s third round which was “phoned-in” by a fan watching the broadcast. Thompson played through tear-filled eyes to give herself a chance in a playoff against So Yeon Ryu and Ryu won. As with the Masters, much of the golf coverage leading up to the 2018 ANA championship focused on what happened to Lexi Thompson in 2017 thus taking away from the normal focus on the previous winner. I cannot remember who won the 2012 Kraft Nabisco (now called the ANA Inspiration) but I remember the image of I.K. Kim missing a one-foot putt for the win. I had to look up the winner – I.K. Kim lost to Sun Young Yoo. Or should I say Sun Young Yoo won the 2012 Kraft Nabisco in a playoff. I would guess most golf fans cannot tell you who won the 2017 U.S. Women’s Open but they will remember Anna Nordqvist was assessed a two-stroke penalty because a television viewer “phoned-in” that her club had grazed the sand in the bunker. This did impact the championship outcome with Brittany Lang coming out on top. A true golf fan will know the name Jean Van de Velde. Van de Velde is famous for his meltdown at the 1999 British Open. Every year the video of Van de Velde’s meltdown is shown sometime during the week of the British Open. I had to look up the winner, it was Paul Laurie. Even Jordan Spieth’s 2015 U.S. Open win at Chambers Bay will always have an asterisk noting Dustin Johnson’s 3-putt on the 18th hole causing him to lose the championship. Most golf fans were not shocked that Spieth won but how he won was shocking. Of course, redemption came when DJ won the 2016 U.S. Open at Oakmont. The bottom line is “a win is a win” (as the saying goes) but it must be frustrating for a winner who’s victory will always be overshadowed by the story of the person that lost. In my post Ricoh Women’s British Open: Forget the forecast – it’s time for women’s golf to shine five questions were posted. Below are the answers to all the questions and more…. (1) Will Yani Tseng win back-to-back Women’s British Opens and end the slump she has been in the last few months? No, Tseng was not able to win. Her final score was 299 or 11 over par for the tournament (Position – Tied for 26 place). She was even par going into the final rounds but shot 76 and 79 to end the tournament. (2) Can Paula Creamer rebound after the loss to Jiyal Shin last week at the Kingsmill Championship? Not completely. Creamer did not play poorly overall but she did not really contented; but then again, no one was close to the winner. Paula was the top American, finishing in 3rd place (final score 289, or 1 over par for the tournament). Although she did not win, Creamer actually had an impressive last round — she was in 10th placed and moved up to 3rd place (which was great given the weather was tough during the last 18 holes.) Creamer still seems to be having trouble with her putter. I’m sure Creamer will eventually fix the putter issues and we will see her back in the winners circle. (4) How will Lydia Ko perform playing links golf and will she outshine the professionals? If Ko were just “any” amateur, everyone would be impressed with her 17th place finish but Ko has won two professional tournaments as an amateur and people seemed slightly disappointed by her performance. Really? She is still only 15, made the cut at a major, won the “low amateur” award at the Women’s British open, and finished in the top 20 — I’m still impressed. (5) If not the youngest player, Lydia Ko, will one of the “seasoned” players have a moment of glory? My hopes that one of the older players might win did not come to pass. Laura Davies, the 48-year-old British player, withdrew on Saturday due to an ankle injury. This was a real surprise because before play was suspended on Friday, Davies was playing quite well. Julie Inkster (the oldest player at 52) finished tied for 26th at 10 over par. She commented to the media that it was the worst weather she has faced in 30-years of professional golf. The title of my previous blog began with “Forget the Weather…” but that was impossible. The weather was a huge story this week. The first day of the tournament was a bit windy but appeared to be what players expected for links golf. Friday was just plain awful. After the first group completed the first 4 holes play was suspended. And, in an unusual (but not unprecedented move) the scores of those players were scratched. Scratching scores has caused some debate in the golf world. I noticed many of the golf analysts that felt they should have played or at least kept the scores were men. I think the tour did the right thing. Let’s remember that many of the LPGA players are quite petite and do not have the additional weight men have (so being blown over for the women was a real issue). Balance is important in a golf swing and many players said that if the wind gusted in their back swing it just blew them off balance. Even Michelle Wie who is quite tall said on Twitter that she felt like a flag pole and added a link to this image on the LPGA website. In my opinion, the only “misjudgement” on the part of the tournament officials — starting play in the first place on Friday. Due to the 2012 Olympics the Ricoh Women’s British Open was moved from July to September and time of year might have a major impact on the final results. Why? Because right now the big story reported from Royal LIverpool at Holylake is the weather. The players faced cold, wind, and even hail during the Pro-Am. Here is a quick video Natalie Gulbis posted from yesterday’s Pro-Am. 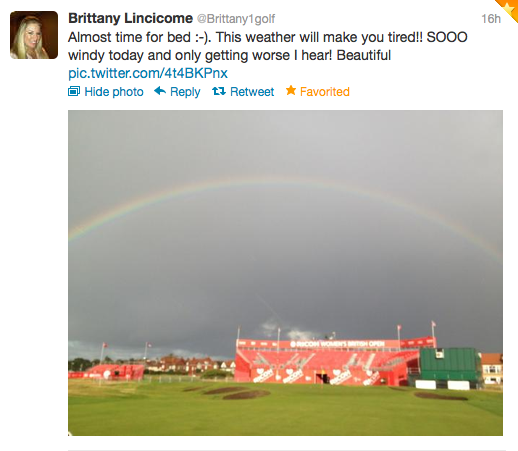 Of course after bad weather comes beauty as shown in this tweeted photo from Brittany Lincicome. (1) Will Yani Tseng win back to back Women’s British Opens and end the slump she has been in the last few months? At the beginning of the golf season all the golf pundits were predicting another big run for Tseng but she shocked the golf world with her poor play this summer. (2) Can Paula Creamer rebound after the loss to Jiyal Shin last week at the Kingsmill Championship? It was a disappointing blow to Creamer to 3-putt on the final hole which forced her into a sudden-death playoff and ultimately lost with another 3-putt on the 9th playoff hole. (3) Will Stacy Lewis win another major and finally get the respect she deserves? Lewis is the top ranked American player and ranked #2 in the Rolex Women’s World Golf Rankings yet she still does not seem to get the exposure that other lesser ranked players get from the golf media. However, I was happy to see that the Adam Schupak wrote a New York Times article yesterday titled Women’s Golf Money Leader Could End U.S. Drought. (4) How will Lydia Ko perform playing links golf and will she outshine the professionals? She has the buzz coming off her amazing win at the Canadian Open this year. The golf writers are already focused on Ko based on the tweet (below) from Kraig Kann, the Chief Communications Officer for the LPGA. (5) If not the youngest player, Lydia Ko, will one of the “seasoned” players have a moment of glory? Juli Inkster is at the open on a “medical exemption” (i.e. she is back after recovering from elbow surgery and has not played the full year so she was given a special exception). I don’t think Inkster will contend given the short amount of time she has played this year. Perhaps another “grand dame” might have a go at it. I’ll be keeping my eye on Laura Davies, a 48-year-old British golfer with 45 careers wins (including 4 Majors and 20 LPGA tournament wins). If the wind is up and experience counts, Davies might just have a chance to tame the links. There are so many other scenarios that could take place. Another Asian golf star (other than Yani Tseng) could win. A player that has been struggling all year (Michelle Wie comes to mind) could suddenly get her game back and win. Or a rookie (hopefully, Lexi Thompson) could thrill the crowd and get her first major. Of course, we can’t forget all the excellent Ladies European Tour (LET) players that could hold the trophy at the end of tournament. Whatever happens this weekend, let’s hope it is an exciting tournament because the Women’s British Open is the major golf event this weekend; and with the PGA taking a week off before the tour championship, this is an opportunity for women’s golf to take the spotlight and shine. Everyone that watched the Masters will have an opinion on moments that were great, good, bad, and ugly. There is no shortage of examples but I’ve picked one player for each category and I also share the player I believe manages to fall into all four categories. First, the greatest moment had to be Bubba Watson on the second hole of the sudden-death playoff. His 40-foot hook-draw shot from the trees, off the pine needles, on to the green to put himself in position to win was awesome. Of course it ended in the most touching moment when he was embraced by his mother (normally, the wife is there to share the moment; but his wife was at home with their new baby son). My vote for the number one good moment — the run that Matt Kucher was making on Sunday to finish with a 69. When Kucher made an eagle on the 15th hole (par 5) and went to 4 under par it was just fun to see a player so happy. There was no arrogance, just joy, in his response. Unfortunately, the bad moments in professional golf tournaments are not always bad shots but bad behavior. Tiger woods wins the bad moment award for drop-kicking his putter. Tiger later apologized but I am tired of professional athletes misbehaving and apologizing later. These are “adults” and need to stop acting like children when something goes wrong. My favorite player, Phil Mickelson, had the ugliest moment. His effort to try to hack the ball out of the bushes at the 4th hole resulted in a triple-bogey. What was he thinking? I mean that would be the kind of stupid shot I would try (not because I could make it but because I am an amateur and don’t always make good decisions). On the other hand, I’m not totally surprised by his choice. I like Phil because he is a risk taker and is exciting to watch. Unfortunately, this time it turned out ugly. So what could possibly be great, good, bad, and ugly? It is the final round score card of the low Amateur, Patrick Cantlay. Look at the card below — birdies, bogeys, double-bogeys, a quadruple-bogey, and eagles! Most golfers would have fallen apart after what Cantlay did on the 13th and 14th holes (quadruple-bogey and double-bogey) but he turned it around on 15 with an eagle. What a great final four holes — eagle, birdie, birdie, par! Cantlay is viewed by many as the best amateur in the game right now and getting the “low amateur” trophy is a good indicator of his future. By the way, other past “low amateur” winners include Tiger Woods and Phil Mickelson. The most amazing thing about watching the Kraft Nabisco TV coverage on Sunday was the sound — the sound of the spectators gasping in unison as they watched, what everyone thought was a “gimme” putt lip-out of the cup. The sound of disbelief that the leader, I. K. Kim missed a one-foot putt. Instead of winning her first major in regulation, Kim was now in a sudden-death playoff. The players would play the 18th hole over and over again until someone won. Well, it only took one playoff hole and it was heartbreaking to see how Kim looked so defeated. As much as I’m sure everyone was hoping she would win in the playoff, it was not surprising to see Sun Young Yoo make a birdie putt and win. Once again, we witnessed how golf tests the mental toughness of players. First, the loss of concentration to miss a “gimme” putt. It is called a “gimme” putt because it is so close to the hole that if you were playing for fun (not scoring for a handicap or anything meaningful), your friends would say “that’s a gimme” assuming you would make the putt. So, you’d pick up your ball and move on. But there are no “gimme” putts in majors. Then, after such a monumental error, the player must have the mental fortitude to get prepared for the playoff. You could tell from I. K. Kim’s body language that she was still in shock from what just happened a few minutes earlier. Her first shot off the tee when left into the rough. That is when I knew that mentally she was done and it would not be a multiple hole playoff. Hopefully, Kim will move on and learn from this experience. We have seen other players “shake it off” after a devastating loss. I wrote a post about Kyle Stanley’s amazing comeback after losing at the Farmers Insurance Open and winning the next week at the Waste Management Open. I’ll be watching now to see if I. K. Kim can over come her “big miss.” Her next opportunity to win will be mid-April at the Lotte Championship when the LPGA goes to Hawaii. A final note on human nature — the sad thing is that most people will not remember Yoo’s win; but they will remember Kim’s loss. This week the ladies play in the first major, The Kraft Nabisco Championship. In many ways this is “The Masters” for the women. I say this because it is their first major of the season (as is The Masters for the men), it has been played at the same course (Mission Hills Country Club in Rancho Mirage, California) since its inaugural tournament (again, The Masters is always played at Augusta National), and the winner jumps into “poppies pond” at the 18th hole as part of the tournament tradition and they are given a bathrobe when they get out of the pond. Many have said the robe is the LPGA’s version of a green jacket (o.k., it is not a green jacket but hey, it’s better than just standing in dripping wet golf clothes). The tournament was not always a major. It started in 1972 as the Colgate – Diane Shore tournament. I remember watching it as a young girl and thinking how exciting it was that the company my dad worked for had a golf tournament. In 1983 it became a major and the sponsor was Nabisco. Amy Alcott won in 1983 and two more times. In fact, in 1991 when she won for the third time she jumped in the pond — this was the beginning of the tradition. The video below gives a great overview of the history of this tournament. This year all the golf pundits are saying Yani Tseng will win. It seems like a “no-brainer” given she has already won 3 times this year, won last week by 5 shots, and is the number one female golfer in the world. But I’m hoping for an upset like last year. In 2011, Stacy Lewis beat Tseng by three shots. Below is a nice video for Stacy Lewis. Don’t get me wrong. Yani Tseng is an amazing player but I want an exciting major — and that will only happen if someone can challenge Tseng. My ideal ending on Sunday would be to see Cristie Kerr go head to head with Yani Tseng and win.